The name of William G Morgan is probably not as popular as Misty May Treanor or Karch Kiraly, but anyone who know the volleyball history will never deny that he is actually the most important figure in this fantastic sport. 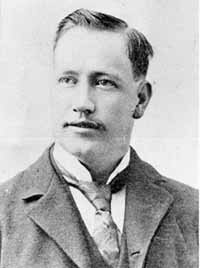 William G Morgan was the man behind the invention of volleyball in 1895 when he served at YMCA Holyoke, Massachusetts as Director of Physical Education. Morgan decided to name the game Mintonette, but the name was no longer used after the game was demonstrated and a spectator of the game said that the game is all about volleying the ball, after that the name volleyball was started being used. William G Morgan was born in Massachusetts and he studied at Springfield College. This is where he met James Naismith, the person who later became the inventor of basketball in 1891. The development of basketball was not only important to its inventor, James Naismith, but also to William Morgan, because that gave him a strong motivation to invented a new game which later known as Volleyball. Even though basketball was a really fun game and entertaining, this sport invloves lots of physical contacts and sometimes could be quite rough. Therefore, not so many older players or members of the YMCA can participate in the game. Seeing this fact, Morgan had the idea of innovating a new sport that allows people of all age groups to take part. When creating volleyball, Morgan took a few different aspects of other sports like Tennis, Handball, Faustball, Baseball, and Basketball then combined them to compose a great game. This game quickly became popular and and so did the inventor, William Morgan. The popularity of volleyball actually realy helpful on Morgan's teaching career, when he became the Director of Physical Education for the YMCA Holyoke in 1896, his classes were favored by the students and always grew in numbers. Volleyball has become an international sport, all through the years this game has gone through so many improvements and supported by many international sports organizations until finally it's performed in many kinds of worldwide class competitions that includes the Olympics. Today almost every nations in this planet know about volleyball, it even becomes the world's second most played sports after football. In honoring the founder of this amazing game, every year The Morgan Throphy is presented for the most dedicated male and female players of the collegiate volleyball by the William Morgan Foundation.